round 1: extended single crochet (exsc) in each stitch across 24 sts, work in established leg pattern across remaining instep stitches <— this makes no sense to me. There are 6 rounds in the leg pattern so how do I know what the “established leg pattern is”? How am i supposed to work that pattern in 24 remaining stitches? Does this make sense to anyone? I’ve attached pictures. Please help! 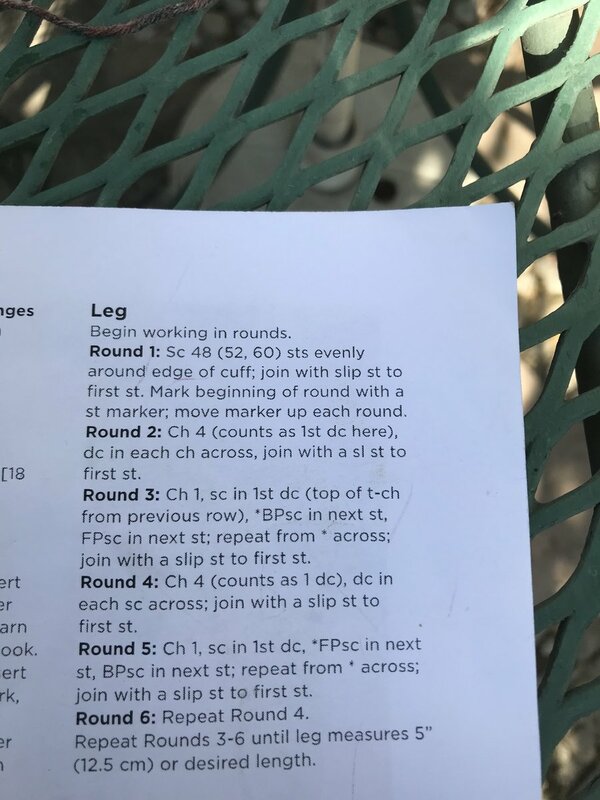 Ok on the leg round 6 it says to first repeat round 4. Then it says repeat rounds 3 through 6 until you reach desired length. 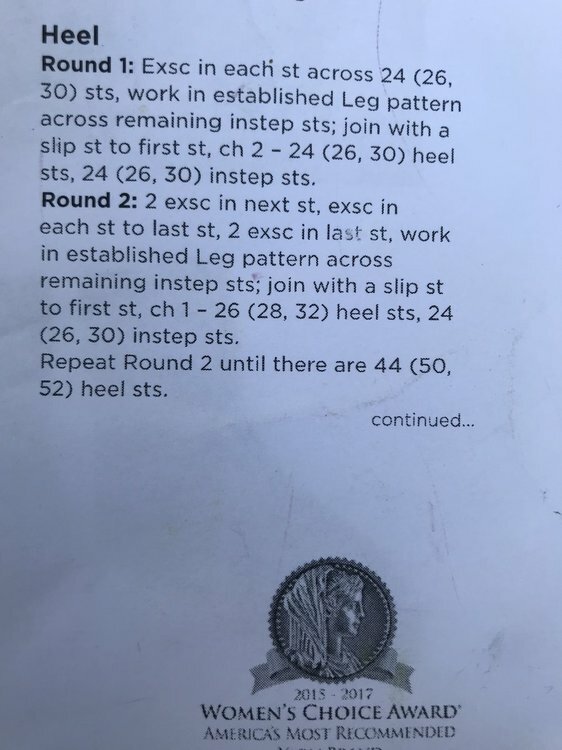 You will continue this sequence of repeating rounds 3 thru 6 while working the heel where in the heel instructions it says work in established leg pattern. 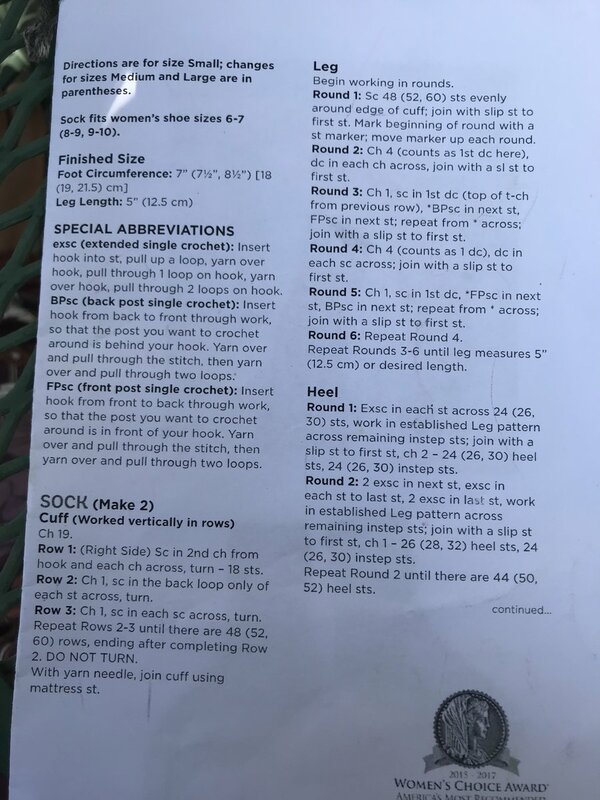 For example if you reached the desired leg length with a repeat of row 3 then on round 1 of the heel according to your established leg pattern you would continue by working round 4 from the leg instructions. On round 2 of the heel you would continue by working round 5 from the leg. @bgs thank you so much for your response. One thing- for round two of the heel how am I supposed to “work the established leg pattern across remaining instep stitches” if the instruction right before that in the same round states to crochet “to the last stitch”? The " to the last stitch" is referring only to the last stitch of the heel section at which point you continue on around following the instructions from the leg repeat rounds. You have made the cuff/leg part. Now, you will work the 2 halves of the 'tube' in a different way. The heel, in the plain/sturdy stitch pattern will increase on either side for a while, then decrease on either side for a while (to probably close to the same as the instep stitch count) to fit the foot because, well, your ankle/heel area is wider than 'the other ends'.